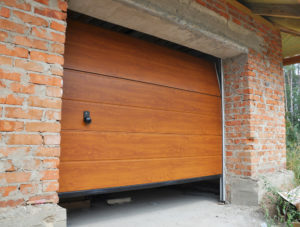 If you’ve never heard of insulated garage doors, you’re missing out. If your home is older, or was built with builder-grade materials, chances are you have a standard steel garage door, with no insulation. If your garage gets as hot as a sauna in the summer and as cold as a freezer in the winter, you are losing out on the benefits of insulated garage doors. If you use your garage for more than parking your car and storing lawn equipment – say you store food items out there or have a refrigerator or a workshop – you could really benefit from an insulated garage door. So could your utility bill. Adding insulated garage doors to a home increases the energy efficiency, because heat is conserved in the winter, and the air conditioning system doesn’t have to work as hard to cool the room next to the garage, or the room above the garage. With an insulated garage door, you could even consider heating or cooling the garage with the new ductless HVAC systems. Just like other insulation products, insulated garage doors come with an R value. The R-Value is a measure of thermal resistance used in the building and construction industry. Specifically, R-value is thermal resistance to heat flow. Many manufacturers use R-values to show the energy efficiency of their product. This number is calculated based on the thickness of the insulation and its chemical properties. The higher the R-value number, the better the insulating properties of the material. Insulated garage doors will cost you more up front, but will save money in your utility bills because of their energy efficiency. Insulated garage doors are available in double or triple layer, with polystyrene or polyurethane insulation. Affordable Garage Doors recommends Amarr Garage Doors, and we are an authorized dealer in the Annapolis area, including Anne Arundel County, Calvert County and Prince George’s County. Call Affordable Garage Doors at 410-887-1112 today for installation and repair of garage doors as well as garage door opener repair.